You might have heard of Tom Burden, who has recently been making the rounds between ABC’s Shark Tank, as well as the SEMA Launch Pad competition back in September. His newfound popularity on the television and expo circuits is primarily due to his latest invention, the Grypmat Flexible Tool Tray. The Grypmat company, founded in 2013, spent two years testing out the prototypes for what would eventually become the product the company was named for. Well, here we are, 4 years later, and Tom Burden couldn’t be happier. 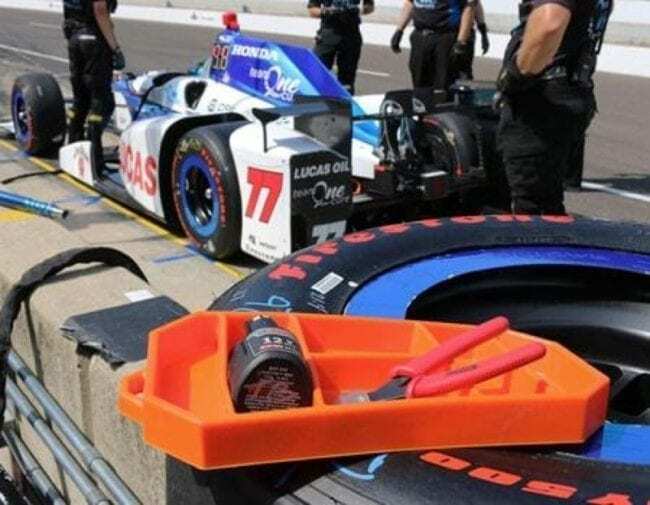 The Grypmat Flexible Tool Tray gives mechanics a flexible, non-slip place to set down their tools without scratching up a paint job. This tray has a unique chemistry that allows it to grip whatever surface it sits on without sliding or falling over. And, since the Grypmat flexes, it can conform to the contours of whatever you set it on. The bright orange tray presents a nice contrast to most tools and fasteners, granting the user better visibility. Because of its polymer-silicone composition, the Grypmat also displays a high resistance to heat and chemicals. It resists static build-up, and since it contains no magnets, cleaning the Grypmat is a breeze. Plus, the two larger sizes of the tray offer a built-in ruler for improved functionality. The Grypmat Flexible Tool Tray is available in 3 sizes, either sold separately or together. The small tray will run $29.99, while the medium Grypmat retails for $44.99. The large size sells for $69.99. Or, if you’d like all 3, the Grypmat Trio Pack is available for $129.99. 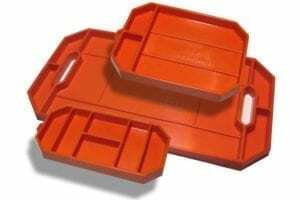 The Grypmat Flexible Tool Tray can be purchased from the company website, which includes free shipping, or from Amazon.com. The Grypmat Flexible Tool Tray seems like a great buy for anyone who spends a lot of time in the shop. The chemical composition is such that this thing will stick to just about any surface you might be working on. Plus, the highly visible orange color presents a nice, stark contrast to monochromatic tools and fasteners, which improves visibility. It might seem a little pricey, especially considering the simplicity of the design, but a non-slip tray that won’t mark up a paint job is probably worth its weight in gold. The Grypmat’s unique chemistry enables it to grip on to whatever surface it is placed on without sliding or falling, while still allowing for easy placement and removal. Grypmat prevents scratches and dents on your beautiful paint job. Tool Accessibility: Any tool, anytime, and any place. The Grypmat is so versatile that you can have your tools where you need them, when you need them. The Grypmat bends, folds, or rolls any way you need it to, always returning to its original shape. With the Grypmat, your tools aren’t going anywhere. Grypmat is made out of a polymer-silicone blend and has specific properties to make it resistant to all types of chemicals. The large and medium Grypmats contain a built-in ruler. For more information, check out the Grypmat Flexible Tool Tray at www.grypmat.com. 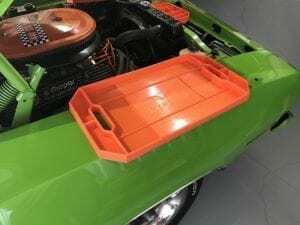 That’s a neat idea and I just may get one, but even though it won’t scratch the paint on a car, I don’t think that I would put it on the fender of my restored 440 Six Barrel 1970 Plymouth Barracuda! 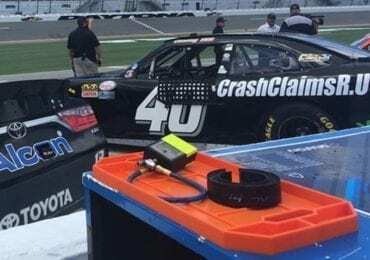 Knowing me I might drop a wrench on it and scratch the paint, and I’d be really upset then, but I guess putting a fender cover down first would prevent that. Will the Gripmat tool tray stay place on a fender cover though?